My wonderful Visiting Teacher invited us over and taught us how to make One Hour Bread. While we were there baking up a storm, she told us about one of her favorite kitchen accessories. "I call these arm aprons," she said. 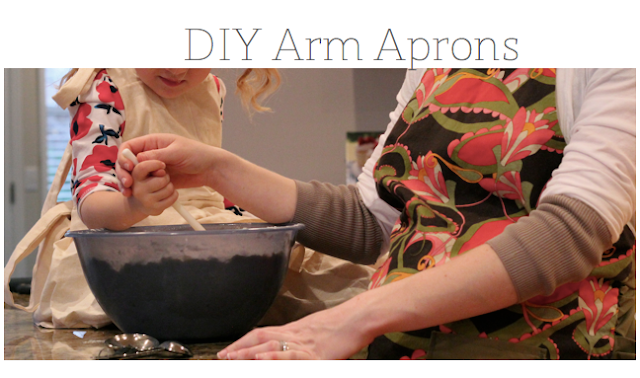 These cut-off socks keep her sleeves up and out of the way while she is cooking, baking, or cleaning. She is a genius I tell you! I was so happy when she gave me a pair and said I could share this idea with all of you. They are simply long socks cut-offs, about 5 or 6 inches long. You could sew the raw edges if your heart desires, but my heart didn't care to do that. And they really work. Yay for no more pushing up sleeves with dirty hands! And to answer your questions, yes I am pregnant. So very very pregnant. what a good idea!! i hate trying to push them up.. over and over and over again! I use socks like that for my drink at movie theaters. A koozie is not big enough around. I bought a pair of socks at a close out at Wal-Mart for 75 cents. Cut off the foot portion. You get two warmers for your hands.